Twitter is not just a social application anymore! 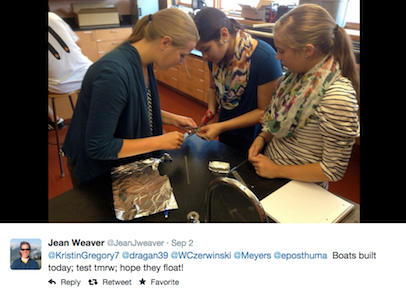 Upper School science teacher Jean Weaver is embracing social media as a learning tool with her chemistry class. Upon returning from the Biennial Conference on Chemical Education at Grand Valley State University this summer, Jean and cohorts from other Midwest schools decided to create an online Twitter dialogue with their classrooms. 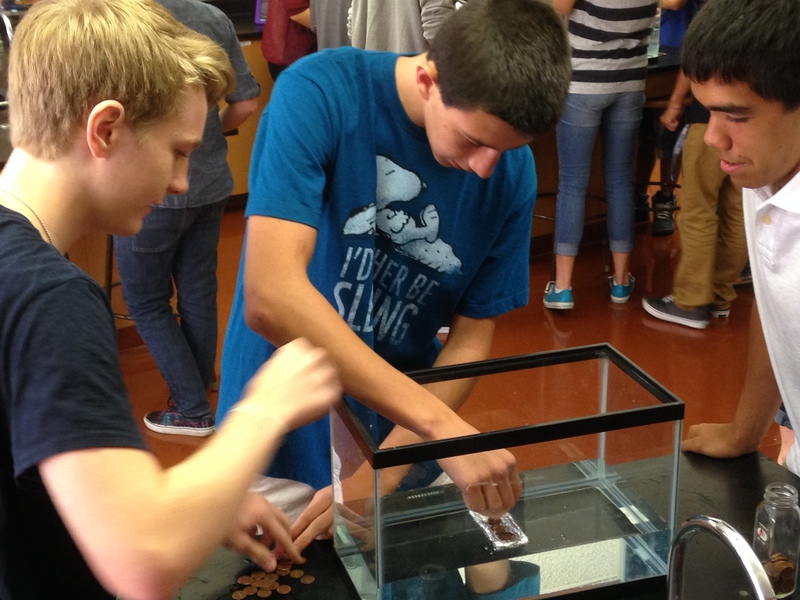 This September during the first few days of school, Dr. Weaver’s chemistry students embarked upon a school challenge with seven other schools located around the Midwest. The challenge was to build a 4 x 6 cm boat out of miscellaneous materials, each with specific “prices”, that was capable of holding as many pennies as possible. The best boats had the lowest ratio of number of pennies held to cost of materials. Student results, including pictures and comments, were then tweeted and shared with the other schools. After seeing the various boat designs that their classmates came up with and how structurally sound (or unsound) they were, the students realized how valuable it is to collaborate with other people, setting the stage for the school year when sharing ideas with classmates will be very important in her chemistry class. The students also witnessed how Twitter can be used to enable people from distant places to collaborate to solve problems. Later this month, the same class will embark upon another multi-school competition in celebration of Mole Day, October 23. #molympics. “In today’s classrooms, social media is being used more and more to supplement lessons and curricula. It’s important for students to realize that social media can serve a purpose much greater than socializing. I’m eager for our next Twitter competition, the Mole Olympics” notes Jean. Be sure to follow Dr. Weaver on Twitter! Be sure to follow Mrs. Weaver on Twitter! This entry was posted in Featured, Technology, Upper School by Communications Department. Bookmark the permalink.